Leading Manufacturer of impact huller and sunflower seed d- huller from Vadodara. 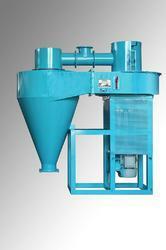 1.MOST EFFICIENT HULLER WITH MINIMUM BREAKAGE & FINES. CONTROL OF SPEED & FEED PERMITTS OPERATOR TO OBTAIN 2.BEST POSSIBLE HULLING OF GIVEN MATERIAL. Replaceable & abrasion resistant special steel impeller blades and impact ring. Variable speed drives to adjust the desired speed to suit specific product quality and moisture content for desired hulling of product. Cyclone with air seal to collect hulled product and discharge on to next processing machinery. Air is recycled between hulling chamber and cyclone to prevent dust flying out. Feed control device in feed pipe to regulate product flow. Capacity depends upon product variety and moisture content. 1. Most efficient huller with minimum breakage & fines. 2. Best possible hulling of given material.